That’s weird. I could’ve sworn I heard something similar just a few weeks ago. What was it again? Exactly how much did they Dusty-proof their team? I mean, that’s just…hold on, I’m being told that one’s real. Apparently, due to a number of minor injuries Scherzer hadn’t gone over 100 pitches in a while and on that mid-September start, he wanted to take on an extra inning’s worth of work. He ended up getting torched in that inning, Baker was slow in getting the bullpen up, and Scherzer threw a total of 116 pitches on the night. Or as Mark Prior used to call it: a side session. And what did Dusty have to say about this? The only surprising part of any of this is that Dusty didn’t tell Scherzer to warm up between innings by trying to body spear Marcus Giles. 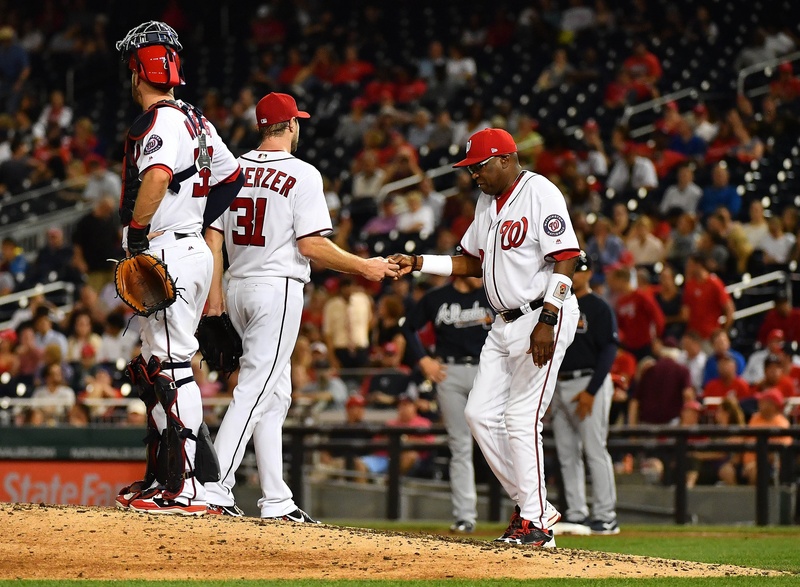 A week and a half later, Scherzer left his final start with the injury. And really, the Nats lucked out that it was a hamstring issue. Scherzer is only the tip of Baker’s pitch count iceberg. Since the Nationals’ bullpen spent most of the summer auditioning for a FEMA grant, their entire playoff rotation ranked among the league leaders in pitches per start. Scherzer’s 100.4 PPS was 10th in all of baseball–just behind Tanner Roark at number nine with 100.5. And they were both soundly outranked by Gio Gonzalez who finished third in MLB with an astounding 105.1. Even the injury prone Stephen Strasburg checked in at 25th with 97.9. We know from painful past experience that treating his starters this way has come back to bite Baker at the worst possible times. And you can make the argument that it already has started to happen again this season. In his last six starts, Gonzalez amassed a bloated 5.85 ERA with 16 walks in 32.1 innings. Not to be outdone, Roark put up an ERA of 4.39 in his final 12 appearances (11 starts) of the season. Suddenly, Baker and the Nationals have created a lot of questions about what should be a deep group of starters. But at least they’ve figured out the bullpen, right? Their midseason acquisitions of Sean Doolittle, Ryan Madson, and Brandon Kintzler were brilliant in solidifying the final three innings of the game. Except here’s the thing: those three pitchers and Matt Albers are also the full extent of Washington’s bullpen depth. If everybody on the starting staff performs up to their capabilities, Baker has a plan in place for innings seven through nine. But with Scherzer’s injury and the possibility of diminished performances from Gonzalez and Roark, suddenly Dusty might be forced to improvise with his relief corps. And as anyone who’s taken a Second City class with the funny guy from marketing can tell you, there’s nothing more painful than bad improv. Ask the 2002 Giants. Or the 2003 Cubs. Or even last year’s Nats who had to watch Dusty go through six (!) pitchers in the decisive four run seventh inning of Game 5. I’m pretty sure that at one point, the umpires had to remind Dusty that the Walter Johnson statue wasn’t on his postseason roster. The NLDS is an extremely short series and could turn on any number of things. But it’s worth remembering going into it that Dusty Baker has spent the entire season doing Dusty Baker things. If any of those starting pitcher workloads come home to roost, that means there could be a key moment in a playoff game where Cubs hitters get to face Joe Blanton or Oliver Perez. And there’s not enough magic dust in the world to fix that.